We all know that deep-frying our foods isn't good for our overall health. With that said, many of the foods that you typically toss in the deep-fryer can also be baked in your oven or tossed onto your grill. 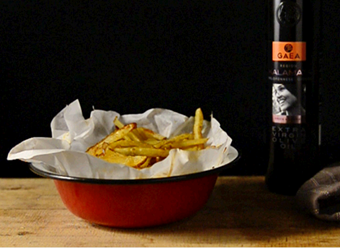 Oven-baking your french fries is a lot more healthier than tossing them into that fatty oil. Plus, I have a tip to share with you. When popping your french fries into the oven, you always want to make sure it has fully preheated! Don't get inpatient and toss them in early as it can cause your potato wedges to become soggy & not bake correctly. Today's recipe is courtesy of Gaea. You can find additional easy-to-prepare and delicious recipes right on the company's website. Scrub the potatoes clean and cut them into slices approximately 1 cm thick. Place them in a bowl filled with water and leave them for approximately 15 minutes. Drain the potatoes, season them with salt and pepper and place them on a baking dish. Top them off with Extra Virgin Olive Oil from the PDO region of Kalamata. Roast in the preheated oven for 25 minutes. Season with paprika. Reduce the temperature to 400 F and bake for 10 more minutes or until they get a nice golden color. These are skinny fries at 1 cm thickness, but I would love to try this recipe. As you stated deep fat frying is so much worse for our health.